Memorial service ideas, are only limited by your imagination. The most important thing to remember, is what loved ones want. More than anything - they want to be remembered. 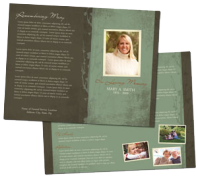 Planning a funeral service, memorial service or Celebration of Life, that reflects your loved one's personality, favorite things, passions, beliefs, is a wonderful way to say goodbye. It's no secret, the funeral service is undergoing a make-over. The funeral service has changed because families have changed. Many families do not have a minister or church affiliation. Many people prefer a spiritual but not religious service. 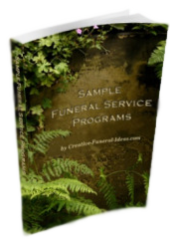 The following provide a selection of unique, creative memorial service ideas. Some are fun and cheerful. Others are traditional and classic. The most important part of planning a this type of memorial service is finding an appropriate place that was special to the deceased. Sometimes the deceased may have specifically requested a location but more often than not it is up to the family to determine an appropriate location. The location of the scattering should be fully representative of the deceased. 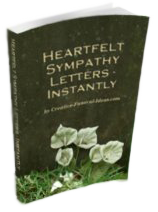 Arrangement for the cremains to be scattered can also be accomplished by contacting a company that specialized in scatterings. These companies will generally aerially scatter the remains from an airplane, scatter remains at sea, and even dispersal by a firework display. Scattering of cremains and especially digging to inter cremains are strictly prohibited at certain locations; these places include archaeological sites and national parks, among others. It is always best to check on the specific local rules and laws for the planned scattering location. 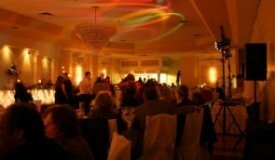 The scattering of the remains can be coupled with a celebration of life ceremony or any type of get together. A possible combination for the wine lover would be a scattering of remains along a coastline with a wine and cheese reception at a local vineyard. If the deceased was an avid backpacker, a memorial multi-day backpack trip with friends and family could be planned with the scattering occurring at a special or favored location along the trip. The remains of a SCUBA enthusiast could even be scattered under water in a memorial dive. If geology was a professional career or interest then a scattering could occur at a specific geologic outcrop or feature. If the deceased was a fan of fishing or water sports then a favored river or lake could be an appropriate location. A surviving spouse may even want to keep the deceased near and scatter the remains under a favorite tree in the yard of the family home. An infinite number of possibilities exist for scattering. However, one thing to keep in mind is that not all friends and family may be able to participate in some of the more extreme locations, especially if they are elderly. Depending on the situation and the personality of the deceased, some of these challenges may be overcome by simply recording the scattering ceremony and then hosting a memorial reception in which the recording is shown. Regardless of the location and method of scattering, the memorial service should accurately reflect the personality of the deceased and show respect to the surviving friends and family.